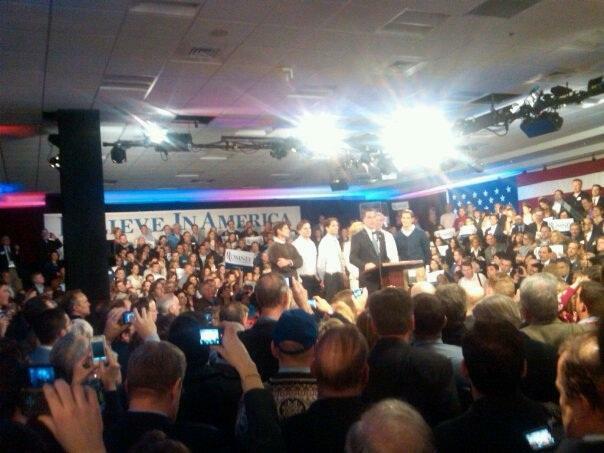 Mitt Romney speaks over repeated cheers from an ecstatic crowd of supporters. "Americans know that our future is brighter and better than these troubled times." He also alludes to recent attacks he absorbed from his fellow candidates for his time at Bain Capital, saying, "President Obama wants to put free enterprise on trial, and in the last few days we've seen a few Republicans join him." He made a chant of the message you've seen plastered from campaign signs and stickers, shouting "We still believe!"